We do arrange tailor made travel in Nepal, trekking tours in Nepal, cultural journeys and adventure travel in Nepal. Here you find Nepal travel tips and some ideas for tailor made individual travel in Nepal, cultural tours and trekking tours in Nepal. All destinations are combinable as tailor-made holidays in Nepal. Meet the lovely inhabitants of these mountains and valleys, indulge in the variety of different ethnic groups and learn about their life and culture, venture on a wild-life safari or enjoy the stunning culture of the Kathmandu valley. Or discover the lush valleys and towering mountains of Nepal on a trekking tour, and enjoy the changing vegetation at different altitude - from the lush Indian plains up to the icy Himalayan peaks. Spend a few days in the Kathmandu and venture on day excursions into the valley, visit Bhaktapur, Patan, Dhunikel and Bungamati. Head South to where the Indian plains meets the lower Himalayas and enjoy 2 full days at Chitwan National Park observing rhinos, tiger or leopard, just to mention a few. Proceed into the gorgeous valley of Pokhara with a stop at romantic Bandipur en route. Relax a few days and enjoy the view over the lake with the snow covered giants towering in the background. In case you get bored, hike for a few days in a stunning natural environment. 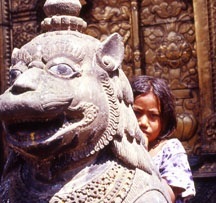 Towards the end of your trip take a flight back to Kathmandu, or travel overland to India. 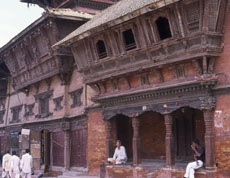 ♦ 03 days - Kathmandu, Bhaktapur and Bungmati: Indulging in the art and architecture of the Kathmandu Valley. ♦ 03 days - Dhulikhel and Namobuddha: Stunning views of the Himalaya Range and experiencing an important pilgrimage site. ♦ 06 days - Pilgrimage Nepal, Kathmandu-Dhulikhel-Lumbini: An insight into Nepal's spiritual life. ♦ 07 days - Kathmandu - Chitwan Tour: Combining the main sites of Kathmandu valley with a few days observing wildlife (rhinos etc.) at Chitwan National Park. ♦ Royal Chitwan National Park: Nepal's best known National Park, home to Bengal Tiger, rhino, leopard and a wide variety of other animals. Safaris are possible by elephant, by foot, by jeep and by boat. ♦ Royal Bardia National Park: More remote and less humid, home to the same variety of animals, but here they are supposed to be seen at day-time as well. ♦ Koshi Tapu Wildlife Reserve: In the remote South-East of the country, grassland with many lakes and rivers. The park is home to almost 440 species of birds. We differentiate between so called tea house treks (accommodation in tea houses, porters carry your luggage) and camping treks (accommodation in tents, equipment and food supplies will be carried by porters / animals). ♦ 04 days - Kathmandu Valley Trek: Grade 1, camping, altitude 1300-2700m. Best time 9-6. ♦ 07 days - Helambu Trek: Grade 2, tea house trek, altitude 900-3500m. Best time 9-6. ♦ 17 days - Ganesh Himal Trek: Grade 3, camping, altitude 700-3300m. Best time 2-5 and 10-11. 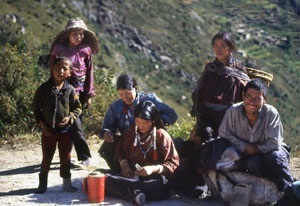 ♦ 18 days - Langtang Gosainkand Trek: Grade 3, tea house trek, altitude 1300-4300m. Best time 3-6 and 9-11. 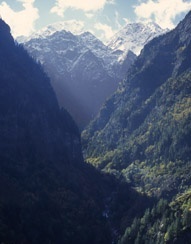 ♦ 13 days - Langtang Valley Trek: Grade 3, tea house trek, altitude 1300-3700m. Best time 3-6 and 9-11. ♦ 07 days - Annapurna Ghorepani Trek: Grade 2, tea house trek, altitude 900-2300m. Best time 9-6. ♦ 10 days - Annapurna Base Camp Trek: Grade 3, tea house trek, altitude 900-4100m. Best time 10-5. ♦ 16 days - Annapurna Jomson-Muktinath Trek: Grade 3, tea house trek, altitude 900 - 3800m. All year. ♦ 10 days - Annapurna Jomson-Muktinath Trek: As above but flying one leg between Jomson and Pokhara. ♦ 16 days - Annapurna Sanctuary Trek: Grade 3, tea house trek, altitude 900-4200m. Best time 2-6 and 9-12. ♦ 21 days - Annapurna Circuit Throng La Trek: Grade 4, tea house trek, altitude 800-5400m. Months 3-6, 9-11. ♦ 17 days - Mustang - Lo Manthang Trek: Grade 3, camping, altitude 900-4350m. Best time 4-11. ♦ 06 days - Royal Trek: Grade 1, camping, altitude 700-1400m. Best time 9-6. ♦ 09 days - Everest View Trek: Grade 3, tea house trek, altitude 1300-3900m. Best time 9-6. ♦ 17 days - Everest Base Camp Trek: Grade 4, tea house trek, altitude 1300-5300m. Best time 3-6 and 9-11. ♦ 21 days - Everest Cho-La Trek: Grade 4, tea house trek, altitude 1300-5550m. Best time 4-6 and 9-11. ♦ 16 days - Everest Gokyo Trek: Grade 4, camping, altitude 1300-5500m. Best time 3-6 and 9-11. ♦ 22 days - Everest Salpa Trek: Grade 4, tea house trek, altitude 400-5500m. Best time 3-6 and 10-11. ♦ 18 days - Dhaulagiri Empire Trek: Grade 2, camping, altitude 800-3400m. Best time 9-6. ♦ 09 days - Bhairav Kand - Sacred Lake Trek: Grade 3, camping, altitude 1300-4300m. Best time 10-6. ♦ 21 days - The traditional ascend to Mt. Kailash from Nepal, Karnali - Nara La Trek: Grade 4, camping, altitude 1200-4600m. Best time 5-10. ♦ 26 days - Dolpo Shey Gompa Trek: Grade 4, camping, altitude 600-5400m. Best time 4-10. ♦ 28 days - Kanchenjunga Base Camp Trek: Grade 4, camping, altitude 850-4700m. Best time 3-6 and 9-11. We also joyfully accept inquiries about tours or routes which are not mentioned here. This page has been created to allow a general overview of options in highest demand.